In addition to these films, this extraordinary volume also includes the full-length feature Victory Through Air Power. Released theatrically in 1943, this powerful propaganda film has never been reissued until now. You'll also see recently discovered on-the-set footage, and get rare firsthand accounts about the work and culture at the Disney Studio in interviews with Disney Legends Joe Grant, John Hench and Roy Disney. Once the United States entered World War II at the end of December, 1941, the nation really mobilized behind those efforts. That included Hollywood, and the Disney studios joined to fight via films meant for educational and propaganda purposes. 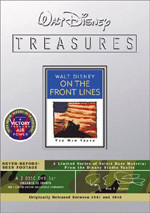 This two-disc set entitled Walt Disney On the Front Lines packages a slew of this material. DVD One splits into three areas. When we look at Propaganda and Entertainment Subjects, we discover 11 shorts. This area opens with a 94-second introduction from Maltin, who discusses the use of animation for these purposes. From there, we head through the 11 cartoons. These include 1942’s “Donald Gets Drafted” (eight minutes, 55 seconds), “The Army Mascot” (7:14), “The Vanishing Private” (7:28), and “Sky Trooper” (7:14). From 1943, we see “Private Pluto” (6:49), “Fall Out - Fall In” (7:23), “Victory Vehicles” (8:06), “The Old Army Game” (6:59) and “Home Defense” (7:47). Finally, 1944 presents “How to Be a Sailor” (7:09) and “Commando Duck” (6:54). All 11 of the shorts feature prominent Disney characters. Donald Duck makes the most appearances, as he stars in seven of the 11. Both Pluto and Goofy show up twice each. I thought the use of Donald seemed the most interesting as well as the most logical. More people can identify with him, and he can also act like a slacker more readily; people wouldn’t as easily accept a grumpy Mickey as a soldier. Although they titled this area “Propaganda and Entertainment”, the latter category strongly dominates. By my reckoning, I only saw two shorts as “propaganda”. “Victory Vehicles” offers a comedic look at ways to encourage citizens to avoid car use. It’s not educational, but it does shove a message down our throats. “Commando Duck” qualifies as propaganda mainly due to its intensely negative portrayal of the enemy. We see stereotypical Japanese here in an otherwise unexceptional short. The other nine cartoons served no discernible propaganda purpose. Frankly, they had little to do with the war for the most part, as they mainly just showed Disney characters in military situations. The cartoons would work just as well outside of a wartime circumstance, though the presence of war makes them stand out a little. They certainly don’t go out of their way to make the military look good. For example, “Drafted” paints a humorously unpleasant picture of army life. None of them really slams the military, though they also don’t provide a rosy glow to service. I scored the shorts on a scale of one to 10 as I watched them, and three earned an “8” or above. “Fall Out – Fall In” got an “8”; it was humor at Donald’s expense and provided an inventive and somewhat surreal experience. Imaginative and clever, “The Army Mascot” could have been cute, but it got a “9” for being charming and fun. Best of the bunch, “The Old Army Game” received a perfect “10”. Clever and funny, surreal and even scary at times, it’s an excellent short. None of the others fall into the “bad” category, but they seem more lackluster than the ones mentioned above. “Home Defense” appealed to me the least and only got a “5”, as it was mediocre and not very amusing. Nonetheless, these cartoons mostly were fun. Note that the first few of the Donald shorts actually present a connected mini-story. We see the Duck get initiated into the army and pursue his dream to be a pilot. This theme peters out after a few cartoons, though, and isn’t present by the last smattering. Also, look for some chipmunks in “Private Pluto” who offer precursors to Chip ‘n’ Dale; that pair didn’t make a formal, named appearance until a few years later. Educational Shorts includes 13 pieces. This three-minute and five-second snippet goes into the various subjects addressed in the cartoons. 1941 provides “Thrifty Pig” (4:11) and “Seven Wise Dwarfs” (3:48), while 1942 gives us “Food Will Win the War (5:41), “Out of the Frying Pan and Into the Firing Line” (3:20), “Donald’s Decision” (3:36), “All Together” (3:00), and “The New Spirit” (7:23). From 1943, we find “The Spirit of ‘43” (5:42), “The Winged Scourge” (9:45), “Defense Against Invasion” (12:37) and “The Grain That Built a Hemisphere” (10:36). 1945 shows us “Cleanliness Brings Health” (8:28) and “What Is Disease?/The Unseen Enemy” (10:36), while we finish with 1946’s “Planning for Good Eating” (8:28). For the most part, the different shorts support a few offices. “Thrifty”, “Dwarfs”, “Decision” and “Together” advertise for Canadian War Savings Certificates, while “Food” is for USDA and glorifies farmers. “Pan” encourages women to save grease and fats for use in weapons, while both “New Spirit” and “Spirit of ‘43” push for citizens to promptly pay their income taxes. All of these connect to the war in that they prod regular folks to help out with the war effort. Really, they seem closer to propaganda than the shorts in that domain; with slogans like “taxes to beat the Axis” and some borderline subliminal imagery, these offered a more pointed line than the prior batch of cartoons. The final six all come attached to the Office of the Coordinator of Inter-American Affairs. These don’t address the war effort, as they exist mainly to encourage public health and safety. The last four are clearly aimed at folks south of the US border, as they use generic Latin personalities to promote cleanliness and other topics. Of these six, only “Scourge” includes an appearance by Disney characters, as the Seven Dwarfs pop up in it. Those six from the Inter-American Affairs group are also the ones with the strongest educational focus. All of the ones for Canada simply ask for money, which is also the case in the tax-related ones. “Food” and “Pan” are slightly educational, but the latter really just encourages public assistance in the war effort; it doesn’t teach anything otherwise. The final six offer actual educational content. Don’t expect much entertainment from these, although they’re interesting to see. The two tax ones with Donald provide the highestlevel of entertainment; despite their underlying attempts to beg for money, they have some fun with the subject. The others are drier, though they provide some occasional Disney-style goofiness to make them more charming than the average public service announcement. I like them more from a historical point of view than anything else, but they remain cool to watch. Lastly, From the Vault presents four sdhkdhsak. We find “Der Fuehrer’s Face” (1942 - 7:58), “Education for Death” (1942 - 10:11), “Reason and Emotion” (1943 - 7:57), and “Chicken Little” (1943 - 8:51). I’m not sure why these didn’t appear in the “Propaganda” domain, as they closely match up with that category. I suspect they got their own subheading because they offer more potential controversy than any of the earlier shorts; each one is more open to interpretation in that way. Easily the best of the bunch, “Face” stars Donald and earns a “10”. It presents a creative and inventive attack on Nazism that also comes across as very amusing. It’s not just simple bashing, as it makes its point neatly and with humor. The story of the Nazi perversion of children, “Death” follows little Hans as he grows to be a robot of sorts. A mix of dark menace and broad comedy, the combination seems weird but interesting to see. The darkest of the bunch, it gets a “7”. “Emotion” combines education and propaganda, as it involves Hitler in the depiction of the appeal to emotion without thought. Creative and lively though sexist, it merits a “7”. “Little” seems similar to “Reason” but without the blatant Nazi imagery. It’s more about whispering campaigns and also works well as it earns an “8”. As we shift to DVD Two, the main attraction comes from the theatrical release Victory Through Air Power. I don’t believe 1943’s Victory has ever enjoyed a home video release in the US, so it alone merits attention for this package. The 69-minute Victory opens with an animated depiction of the history of aviation. We watch as flight begins and grows and also how it develops into military applications. Then Major Alexander P. de Seversky discusses the strategies of air warfare and various related elements. Through his chats as well as animated depictions of the then-current fight and challenges, we get a picture of air technology and tactics. Seversky goes through his concepts and the film pushes a more active form of air power, as implied by the title. To be sure, Victory presents an unusual feature film from Disney. Though entertaining at times, one can’t call it a piece of entertainment. It includes those elements as well as both educational and propaganda overtones. I won’t call it a fun flick, but it’s very interesting and definitely an intriguing time capsule. Next we get a collection of “Training Shorts”. We find three examples of this form: “Four Methods of Flush Riveting” (1942 - 9:31), “Stop That Tank” (1942 - 21:35), and a “Training Film Montage” (5:14) that consists of tidbits from a mix of shorts. During his introduction, Maltin implies these are dull, and he’s right, though “Tank” starts with a humorous depiction of Hitler and a few other comedic moments. Nonetheless, they weren’t created for entertainment, and they add a cool look at history to this package. And what a great package it is! Whereas many of the Disney shorts found on other DVD collections have appeared in other places, the majority of the material from Walt Disney On the Front Lines hasn’t been seen in years. A mix of entertainment, propaganda and educational pieces, it’s all a lot of fun to see for a mix of reasons. 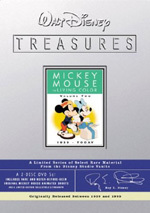 Walt Disney On the Front Lines appears in an aspect ratio of 1.33:1 on these single-sided, double-layered DVDs; due to those dimensions, the image has not been enhanced for 16X9 televisions. The quality of the materials varied and didn’t always seem as positive as the average Disney content, which probably related to the fact that these were more obscure pieces; they’d not been out there for public consumption over the years. I also reckon that the faster than usual production schedule may have led to more sloppiness than usual, which resulted in minor issues. Nonetheless, the elements still looked quite good given their age. Victory was the most consistently attractive. It seemed clean and fairly concise, with bright colors. The others varied more substantially. Most of the shorts lacked substantial source defects. They appeared somewhat dusty and manifested occasional spots, but that was about it, as they usually suffered from no noticeable flaws. Sharpness caused a few minor problems, as the shorts sporadically came across as a bit soft; close-ups boasted good definition but things sometimes became looser in wider images. Colors also varied and were usually fine. I didn’t expect a broad palette for this sort of material, but here some sloppiness interfered. For example, Donald’s feathers occasionally looked slightly pinkish. Still, the tones were mainly solid, and blacks also looked deep and firm, with good clarity in the occasional low-light images. The “Training Shorts” presented the roughest of the bunch, which didn’t come as a surprise. Nonetheless, my overall impression of these cartoons was positive. Not surprisingly, the monaural soundtracks varied. Some of the mixes came across as clean and reasonably vibrant. For more than a few of the shorts, the audio sounded moderately robust, with clean highs and pretty nice bass response; music and a few effects brought out decent low-end at times. However, other shorts came across as thinner, rougher and more restricted. Again, the “Training Shorts” demonstrated the majority of the problems, as they presented some distortion and background. Otherwise, although the elements were erratic, they usually offered fairly good definition and accuracy and were pleasing for material of this vintage. We get a nice roster of supplements spread across the two DVDs of Walt Disney On the Front Lines. The disc opens with an introduction from film historian Leonard Maltin. In this 64-second clip, Maltin discusses Disney’s entrance into the propaganda business and sets up the background of the program. Maltin also provides informative introductions for the “Propaganda and Entertainment” (97 seconds) and “Educational” (three minutes, five seconds) domains as well as for “Der Fuehrer’s Face” (77 seconds), “Education for Death” (66 seconds), “Reason and Emotion” (31 seconds), and “Chicken Little” (52 seconds). When we shift to DVD Two, we locate a mix of additional supplements. The platter opens with a new 40-second introduction from Maltin. He briefly goes over this disc’s contents. Maltin also introduces other Victory (four minutes, 33 seconds) and the “Training Shorts” (95 seconds). On the Set of Victory Through Air Power lasts for five minutes and 43 seconds. It opens with an introduction from Maltin who lets us know what we’ll see. From there we find silent footage shot during Power, most of which just shows set-ups for the host. Frankly, it’s not very interesting to watch, but it makes for an unusual historical artifact. Next we find the trailer for Power, which lasts 132 seconds. After that, we locate three collections of Interviews. We hear from story man/artist John Hench (14 minutes, 18 seconds), story man Joe Grant (14:47), and Walt’s nephew Roy Disney (20:46). The first two discuss the military presence on the studio lot, the atmosphere of the era, the effect on the studio’s work, approaches to the subject matter, and notes on some of the specific pieces. 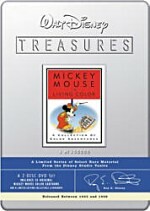 Disney touches on similar subjects but from the viewpoint of a child during the era, and he also gets into the significance of the material and its place in the studio’s history. All three interviews are engaging and informative, and they offer a lot of solid notes about Disney during the war. In the Galleries area, we locate seven different collections of stills. We see “Production Art”, which then breaks into 18 shorts: “The Thrifty Pig” (four frames), “Seven Wise Dwarfs” (2), “Donald’s Decision” (10), “The New Spirit” (25), “Donald Gets Drafted” (16), “The Army Mascot” (26), “Food Will Win the War” (13), “The Vanishing Private” (11), “Der Fuehrer’s Face” (18), “The Spirit of ‘43” (15), “The Winged Scourge” (5), “Education for Death” (17), “Private Pluto” (23), “Fall Out - Fall In” (6), “Victory Vehicles” (6), “The Old Army Game” (17), “How to Be a Sailor” (11), and “Commando Duck” (40). ”Victory Through Air Power” splits into four domains: “Visual Development” (18), “Story” (121), “Backgrounds” (21), and “Publicity” (8). Next we get a “Poster Gallery” with 27 7informational and propaganda sheets; none of these advertise the shorts, as instead they warn against various problems and push for support of different elements. “Dispatches from Disney’s” presents 37 images from the sole issue of studio newsletter that went out to the troops and others. “The Gremlins” presents 31 frames connected to a failed attempt to adapt a Roald Dahl tale; mostly it shows a rare illustrated storybook adaptation of the unmade flick. In “Joe Grant’s Sketchbook”, we locate 44 frames with photos and drawings by the conceptual artist and storyman. Lastly, the “Insignia Gallery” displays 59 of the art created for the exterior of military vehicles. A few of the frames include commentary from Maltin. We find these for 48 of the stills. Look for the microphone icon to signal these. Maltin provides a few interesting notes about the appropriate subjects. All together, this is an excellent collection of materials. A few physical materials round out the set. The booklet includes a short note from Maltin plus DVD details and small images of posters and rough sketches. A roughly 5X7 card presents a replica of a “Fall Out - Fall In” poster with a few comments on the back. Lastly, a “Certificate of Authenticity” declares this set a limited edition of 250,000 and tells you which number belongs to your copy. 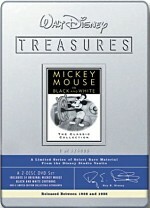 Past Disney Treasures included these numbers embossed on the tin that houses the package, but that doesn’t happen here. One of the most eagerly-awaited collections of Disney animation, Walt Disney On the Front Lines doesn’t disappoint. It contains hours of material that illuminates various efforts during World War II, and it’s a great set of rarely-seen pieces. The DVD provides picture and audio that are erratic but mostly good for their age, and the extras add a nice look behind the scenes. For animation fans, Lines is a “must have” product – run out and grab this one immediately.